Sure, you could hike your way to a spectacular view of the city, but why not do it in style with a stunning fine dining experience? Time Out staff rise to the challenge of finding the best Hong Kong restaurants with a view. Though fusion is so over, you’ll never get over the view at Aqua. 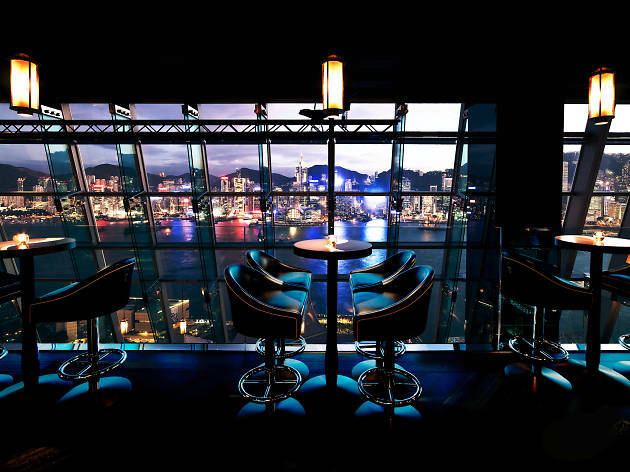 On the 29th and 30th Floor of Peking One, you’ll probably never have a better view of the Hong Kong skyline. To be fair, Aqua’s menu – which features Japanese-Italian fusion – does have a wide selection, which is all cooked impeccably. 29/F-30/F, 1 Peking Rd, Tsim Sha Tsui, 3427 2288; aqua.hk. At the top of LKF Tower, this restaurant offers great vistas. Perched atop your culinary ivory tower, order some of Azure’s modern French cuisine. Try the salmon and tuna tartar parfait or the pork rack, both excellent. There’s also a posh bar and lounge in the restaurant. 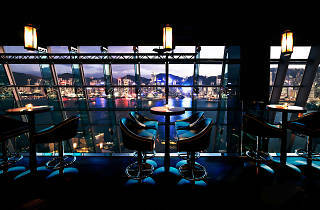 29/F, 33 Wyndham St, Central, 3518 9330; azure.hk. Rich is the only word to describe the decor and the menu at Caprice. Sit in chairs decked out in rich red velvet while you dine on foie gras and langoustine under crystal chandeliers. Located in the Four Seasons, Caprice looks over the harbour, so you’ll have a great waterfront seat. 6/F, 8 Finance St, Central 3196 8888; fourseasons.com. Elegant avant-garde minimalism meets contemporary fusion cuisine in the very trendy – and very pricey – Peninsula restaurant. The ambience is unforgettable, especially with the harbour view. And, if you’re a guy, make sure you go to bathroom for the unique urinals. 28/F Salisbury Rd, Tsim Sha Tsui, 2315 3188; hongkong.peninsula.com. This isn’t your grandma’s fried rice. Michelin-starred Hutong does high-end Chinese food with mostly northern dishes from Beijing. The views from are breathtaking (and almost as good as from Aqua above). 28/F, 1 Peking Rd, Tsim Sha Tsui, 3428 8342; hutong.com.hk. Facing Victoria Harbour, this Italian restaurant serves up Mediterranean fare. There is an extensive wine list and the homemade pasta comes especially recommended. Podium 3-4, IFC Mall, Central, 2383 8765; gaiagroup.com. This upscale Cantonese restaurant dishes up carefully crafted, traditional dishes. Two stories and designed in the style of a 1930s Taipan mansion, One Harbour Road is more a business type of place, so take your high-class client for the picturesque vistas. 8/F Grand Hyatt Hong Kong, 1 Harbour Rd, Wan Chai, 2584 7938; hongkong.grand.hyatt.com. Affectionately abbreviated ToTT’s, Talk of the Town is on the top floor of the Excelsior in Causeway Bay, and has an amazing night-time view, not to mention excellent comfort Western cuisine – think oysters, steak, and pork chops. 34/F, Excelsior Hotel, 281 Gloucester Rd, Causeway Bay, 2837 678; mandarinoriental.com. International super-chef Alain Ducasse finally landed in 2003. Ever since, his innovative French food has been dazzling customers. Indeed, the waterfront view might be the only thing that comes close to matching the food. 18 Salisbury Rd, Tsim Sha Tsui, 2313 2256; hongkong-ic.intercontinental.com.